Vanessa Dina, Kristina Fuller, and Gemma DePalma founded The Meat Club for women who want to have their meat and eat it too. This recipe, from The Meat Club Cookbook, came to them from their French friend France, who incidentally comes from France. This cold-weather meal gets better the longer it sits. 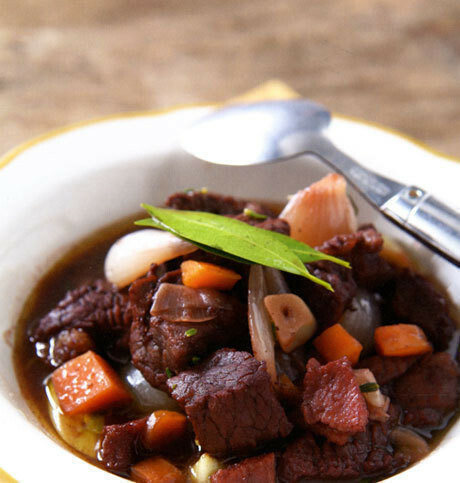 This recipe calls for two types of stewing meat for richer flavor-the classic stewing meat from the chuck and the famously tender top sirloin. Let your butcher know so he can cube your pieces in advance. Posted by Chronicle Books • Published 29th January 2012 • See Chronicle Books's 41 projects » © 2019 Leslie Jonath / Chronicle Books · Reproduced with permission. Melt the butter in a large cast-iron casserole over medium heat. Add the bacon and brown until softened but not crispy, about 5 minutes. Remove the bacon and save for another use. In the same pan, cook the meat in batches until browned evenly, 4 to 5 minutes per side. Once browned, return all the meat to the pan and sprinkle the flour over it. Mix well. Add the wine to cover the meat. Stir in the carrots, onions, garlic, thyme, and bay leaves. Cover and cook over low to medium heat until the meat is tender enough to cut with a fork, about 2 hours. Add salt and pepper to taste. I don't eat meat but this looks delicious. I might try making it with tofu. Yum!